Janet and Joan Markham were first seen in a previous Aunt Bessie book and now have a series of no-murder cozy mysteries, and I enjoyed watching them team up with Bessie. 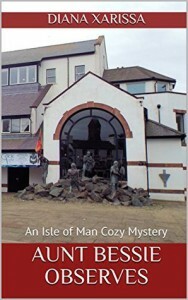 In the Markham Sisters mystery The Jackson Case, a pair of con-men swindled a charity out of its proceeds from a charity auction. and in Aunt Bessie Observes, both found murdered. I'm not really sure what Bessie observed, other than the horrifically garish theme cottage that neighbor Maggie fixed up (which made me laugh out loud!) but this was still an entertaining and enjoyable read with a fascinating cross-over mystery.